The verdict is in: I’m an idiot. I could have been in the jury pool for the Mike Hubbard trial in Opelika. Could it be? The Holy Grail of Lee County trials? The trial of Alabama House Speaker Mike Hubbard on 23 felony charges related to ethics violations? Mind you, my excitement related more to being part of an event, a happening, something historic. Yes, I have read my own tweets about the evidence and the delays. I harbored no illusions. But still; this would be awesome. I realize that Judge Jacob Walker III had mentioned an earlier trial that he would need to clear out before the Hubbard trial could begin, so I was also prepared for that. 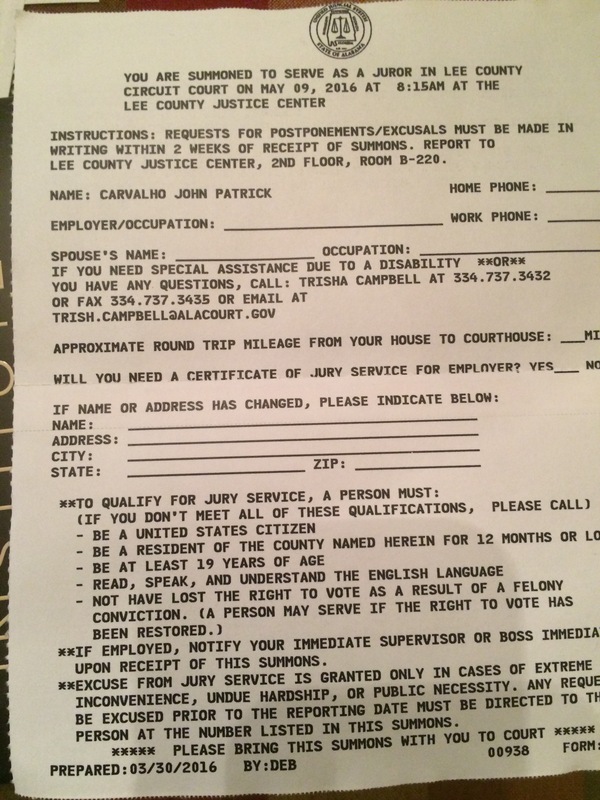 Then, a couple of weeks later, I received a juror’s questionnaire. A long one. Lots of questions about crime, politics, the courts. And the questionnaire cautioned that the trial could last three weeks. That was the tip. So I sent it in and then prepared myself. I stopped tweeting about the trial and talked about it only a little. I told a few friends, when it was relevant, about the jury pool thing. They thought it was funny too. Then my stupidity set in. First, let me plead prior experience — and while I do so, sound like one of my own students after missing a class event. I had been called to jury duty twice when I lived in California. You were notified that you were in the pool, then the day before, you were contacted and told whether to show up. Then, I noted in the papers that jury selection would begin on May 16. 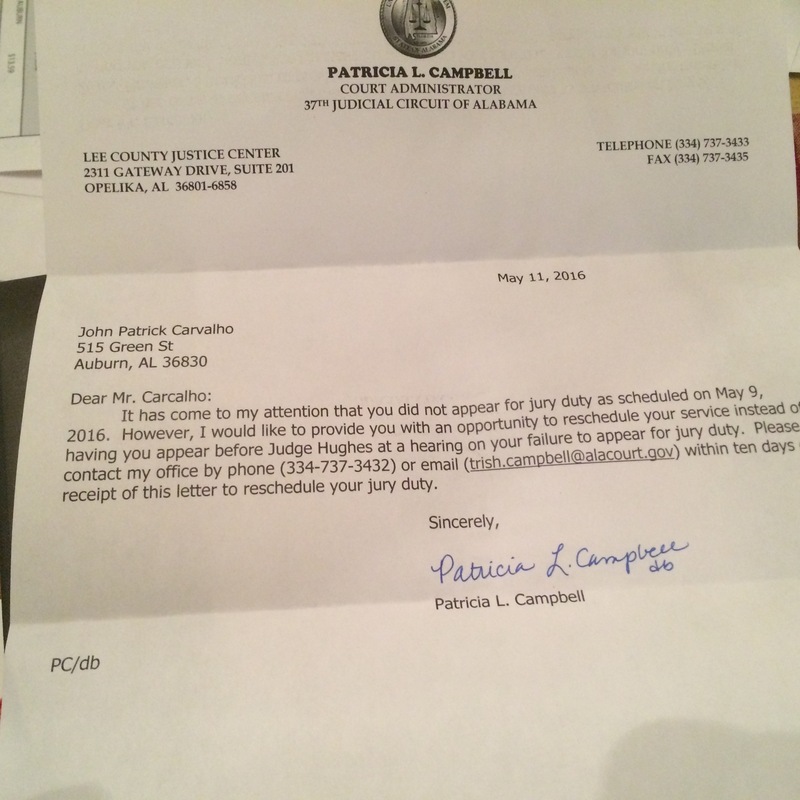 Yes, I KNOW that I did not hear anything from Trisha Campbell, court administrator. Yes, I KNOW that my most recent official instructions said May 9. So, after not getting a call I wasn’t promised, I did what any know-it-all professor would do. I didn’t show up. I looked forward to the fun on May 16. Friday morning, at our weekly Chappy’s crew breakfast, I even asked Sheriff Jay Jones about parking. He told me it would be catch-as-catch-can, but he pointed out a couple of less-used parking areas. I was mortified, more than usual. When I teach Reporting, I take my students to cover trials at Lee County District Court. Trisha Campbell and her assistant, Rebecca, have always been helpful to my students — letting us know which trials were at a better point for coverage. And now, I had blown her off. I e-mailed her immediately and apologized. So on Monday morning, while Alabama news hounds focused on the T.K. Davis Justice Center, I typed this blog. I also served on the jury for a master’s thesis defense, since I had lost my excused absence. I would not march into Judge Walker’s court with 100-plus other prospective jurors and hope that Elizabeth White (WTVM) or Katherine Haas (Opelika-Auburn News) would see me. All because I am a too-cool-for-school idiot who can’t follow directions. Don’t look at me. It’s too hideous. Or maybe ignorant foot fungus to a footnote. I seriously doubt that I would have ended up on the jury. They hear “professor,” they hear “journalism,” and if it were possible, a spring-loaded chair would have boing-ed me back to the catch-as-catch-can parking lot. Plus, I hear that employment at Auburn disqualified a few prospective jurors anyway. But I have learned my lesson. So I can announce: if anything comes of the charges against Gov. Bentley, Roy Moore, Hillary Clinton, Donald Trump, Queen Elizabeth, or anyone, I am willing to serve. I’ve got this “show up at the correct date and time” thing down, I think.